Here at CMB, we know that our users are intelligent — you’re smart enough to have chosen us after all! Joking aside, what you may not know is that we are indeed, statistically, a favorite among highly educated professionals. Believe it or not, over 35% of our member base has a master’s degree or higher. Compare that to the national average of people with master’s degrees or higher at 12%, you guys are a bunch of smarty pants! Naturally, we were curious to see if having a graduate degree, or other further degree, has any correlation to a member’s attractiveness and preferences. We looked at over 20 million matches and here’s what we found. Let’s start with the dudes. The judicial system is (at least supposed to be) all about equality and fairness, right? So it only makes sense that you JD bagels fall right in the middle of both being LIKED and how picky you are. Equality for the win! While you’re third to doctor and business bagels, you’re still killing it ahead of PhD, bachelor’s and master’s holders — it looks like the ladies are partial to men with specific professions, and you guys are equally as picky. Keep up the equality gents! Not too different from the men, you lady lawyers are situated right in the middle of all the other degrees, a continuation of my hypothesis about lawyers being fair and equal. However, you gals surpassed female MBA holders, where as ladies preferred MBA men ahead of JD guys. You also probably noticed that men are particularly hot for women who only have their bachelor’s. The good news is, we don’t think this is a sign that men don’t find high achieving women attractive — after all, female MDs were the second most liked. My hypothesis? Maybe the issue here is more related to age. Naturally, a woman with a JD or PhD will be older than a recent undergrad graduate, and you know how those men love those younger women — I’m totally rolling my eyes right now. What’s Trending In The Profiles Of Bagels With JDs? Realizing that the type of degree someone holds has a clear impact on their attractiveness, I was curious if there is a distinctive way people with different degrees present themselves on their profiles. Are there words or phrases that are commonly used amongst bagels with JDs? We loved how OkCupid conducted a similar study (but with race), so we emulated their methodology in this study. We looked at all of our users who have JD’s profiles and isolated words and phrases in their profiles that were used most frequently. The results? Check out the chart below. FYI – For those of you who are not familiar with Coffee Meets Bagel, here’s an example of what a member’s profile looks like on Coffee Meets Bagel (this is mine). The words used in the last three sections of the profile are what we used for this study. The trend of alluding to your profession/degree in your profile was recurring for each degree, but you law degree holders really take the cake. 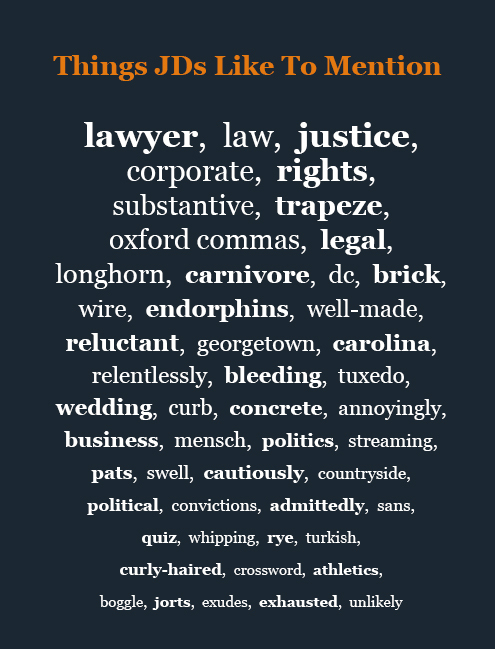 “Lawyer,” “law,” “justice,” “rights,” “legal,” even “oxford commas,” the list goes on. But according to our data, Lawyers are also raging meat lovers. I certainly can’t picture any lawyers I know on a trapeze or wearing jorts, but apparently those are things you guys are into. I’m only just a tad bit concerned about the trends of “whipping” and “bleeding.” I know lawyers can be scary, but that just brings it to a whole new level. Please don’t hurt yourselves (or anyone else). We can’t be totally sure what’s going on here, but it sure is interesting. Overall, it looks like men are into women with less smarts than them (frowny face), and women lust after doctors and businessmen. What do you think? Who Has More Fun when it Comes to Dating: New York or San Francisco? Top Date Tip for the Spring: Spring = Flower time!